Reading a recent blog on Mashable, I was astonished to learn of some iPad app magazine techniques practised by some of the titles we all admire and look up to. 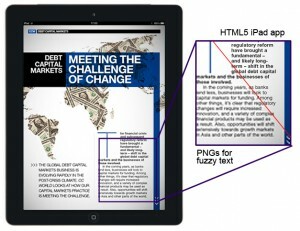 The article was: Why Do Magazines Look So Terrible on the iPad 3? It described the process of producing magazines from InDesign – so far so good – and then outputting the page layouts as PNG files to then piece together into the issue. Some serious heavy weight names are doing this, from publishers who are household names we have a lot of time for (so we shan’t name or shame here). To me rendering text as a graphic is a sin against good practice (not to mention usability and accessibility). What’s worse, the file size of the resultant piece goes through the roof. A paragraph of text as HTML is less than 1kilobyte. A .png of the same paragraph is more than 10kb. This means file sizes are huge, download time is slow and space on people’s devices fought over. There’s always griping when new technology is released but usually at the producer of the device, not the creator of content. However in this instance the huge resolution improvement of the iPad3 has exposed cut-corners in magazine production that are not Apple’s fault. A wise old communicator once told me “a complaint without a solution is just a moan”, so to avoid being accused of whining, what is the solution? It’s actually quite simple: Whether making a locally storable app, a downloadable issue of a magazine or a web-based publication that caches to the device, use the right systems and the right technology to ensure the best user-experience.